Taking a trip down the laundry detergent aisle at your local store can be a confusing process for some shoppers. Most of that confusion is a result of new high efficiency (HE) detergents used in front-loading washers. Front-loading washers use drastically less water than traditional top-loaders. Because of that, manufacturers have developed special HE detergents that provide the same cleaning power as traditional laundry detergents but produce less suds. Washing machine manufacturers often require the use of HE detergent in new front-loaders but in the case of HE Tide, it can be used in your top-loader too. 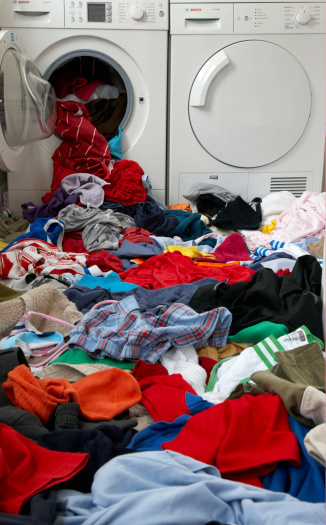 Front-loading washers will overflow with suds if you don't use HE detergent. Read through the directions on the label of your Tide HE detergent, to ensure there are no special precautions or notes for use in a top-loading machine. Measure out HE detergent according to the directions listed on the bottle. Tide representatives say it will work in top-loading washers but note that you will see reduced suds. HE detergent is formulated to work in less water. Double the recommended amount of detergent, if you feel not enough suds are being produced or laundry is not cleaning properly. Many consumers report doubling the recommended amount without any problems. Nathan Ryder has been writing professionally since 1996, appearing in "Teen People" where he was one of their first regional correspondents. He's continued writing for print and broadcast news outlets in Indiana and Arizona, including the leading news and entertainment website, AZCentral. Ryder earned a Bachelor of Arts in journalism from Arizona State University. What Can Be Used to Reduce Suds in a Washing Machine? How Does a Top Loading Washing Machine Without an Agitator Work?